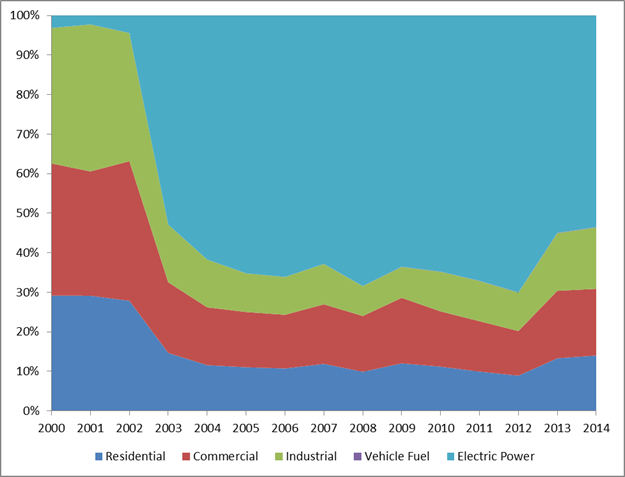 Energy Information Administration (EIA) statistics for the year 2013 reflect approximately 2.66 million natural gas customers in New England; 2.4 million residential customers and about 274,000 commercial and industrial customers (see table and charts below). The Energy Information Administration’s 2014 Annual Energy Outlook projects New England natural gas consumption to grow at a 0.4% annual rate through 2040. 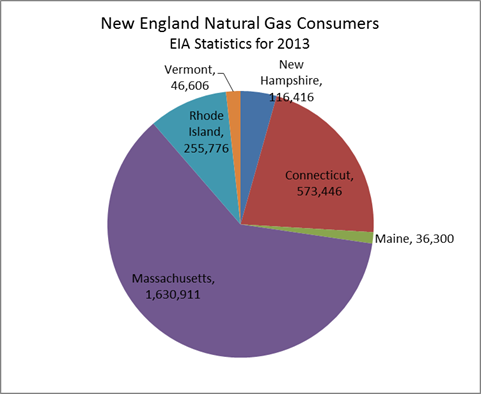 In New England, New Hampshire ranked fourth in total natural gas consumption in 2014, behind Massachusetts, Connecticut and Rhode Island. Natural gas is the primary heating fuel for 38%* of residential homes in New England. The fastest growing gas consumption sector, nationally and regionally, has been gas for electric power generation. Gas-fired electric power generation accounted for approximately 30% of total natural gas consumption in New England in 2000; in 2014 it accounted for nearly 40% of New England’s natural gas consumption. 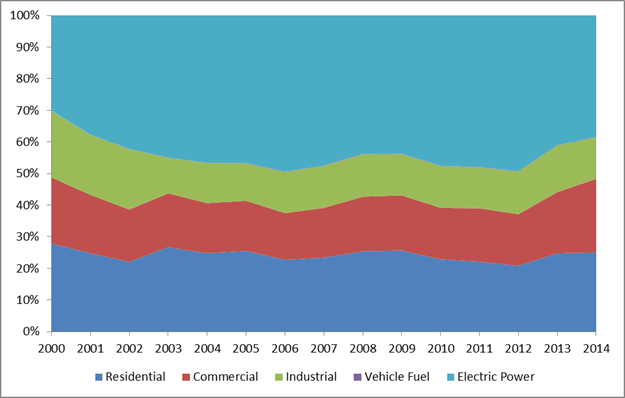 In New Hampshire, gas fired electric power generation facilities accounted for just 3% percent of total natural gas consumption in 2000; in 2014 it accounted for 54% of total natural gas consumption. The Distrigas of Massachusetts LNG terminal in Massachusetts is one of the first major operating import terminals for LNG in the United States and imports gas from other parts of the world where local market needs are much less than the available supply. The primary source of LNG supply into New England in recent years comes from the rich gas supply region of Trinidad and Tobago, off the coast of Venezuela, and additional cargoes arrived in 2010 from Egypt and Yemen. The LNG is transported to New England via large ocean-going tanker ships.